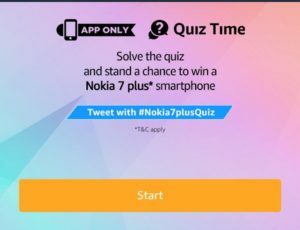 1 How to win Nokia 7 Plus from Amazon Nokia 7 Quiz? 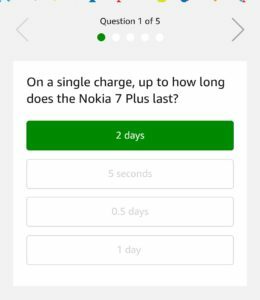 2.1 Q1) On a single charge, up to how long does the Nokia 7 Plus last? 2.3 Q2) The Nokia 7 Plus runs on __, which ensures it gets the latest security and OS updates. 2.5 Q3) What mobile platform is the Nokia 7 Plus built on? 2.7 Q4) Which of these lens manufacturers did Nokia partner with for the Nokia 7 Plus? 2.9 Q5) Which of the following is NOT a feature of the dual camera set up on the Nokia 7 Plus? 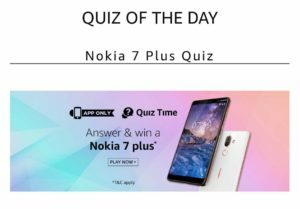 As all of you know that Nokia launched its new Smartphone Nokia 7 Plus and Amazon is promoting it with a new Amazon Nokia 7 Plus Quiz. In this contest, you have to answer 5 simple questions to get a chance to win Nokia 7 Plus and to make this easier we adde all the answers of Amazon Nokia 7 Quiz. The Nokia 7 Plus is a Nokia-branded upper-mid-range smartphone running the Android operating system. It serves as the successor to the first-generation Nokia 7. Just answer 5 simple questions to get a chance to win Nokia 7 Smartphone. This quiz will remain live until 25th May 2018. You have to go to the bottom of the Amazon App Home page to enter this quiz. We also added Amazon Quiz Winners List, you can check that from the below mentioned link. 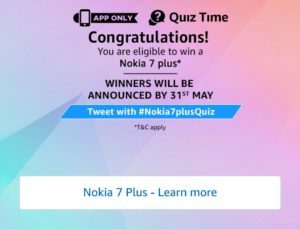 How to win Nokia 7 Plus from Amazon Nokia 7 Quiz? 2. Open the app and you will see a banner about the Nokia 7 Quiz Time contest. Click on it. 3. Now click on the ‘Start’ button to begin the Amazon Nokia 7 Plus quiz. Q1) On a single charge, up to how long does the Nokia 7 Plus last? Q2) The Nokia 7 Plus runs on __, which ensures it gets the latest security and OS updates. Q3) What mobile platform is the Nokia 7 Plus built on? Q4) Which of these lens manufacturers did Nokia partner with for the Nokia 7 Plus? Q5) Which of the following is NOT a feature of the dual camera set up on the Nokia 7 Plus? 5. After answering all 5 questions correctly. That’s it. Just wait for the Winners list of Nokia 7 Quiz. 1. This Contest will commence on 14th April 2018 from 12:00:01 a.m. (ISto 25th May 11:59:00 p.m.
5. The draw of lots will be carried out during the Contest Period for the questions and a total of 4 (Four) participants will be selected as winners by a random draw of lots. A total of 4 (Four) participants will be selected as winners of the Contest. 6. The declared winner(s) will be eligible for winning a Nokia 7 Plus devices each (hereinafter referred to as “Prize(s)”). I eligible the Nokia 7 plus then I get that order!!!!! i have played too many quiz but didn’t get anything. but i know my time will also come. One ticket available (West stand Ground Floor) for today RCB vs SRH match in Hyderabad. Contact 9866482481 for details.